Science diplomacy is a term often used to describe how science can serve as a vehicle to create transboundary and cross-disciplinary partnerships through scientific collaboration. It can mean different things to different people, ranging from integrating sciences in diplomacy to integrating diplomacy in science. To that list, we should add engineering diplomacy, which is to engineering what science diplomacy is to science. There is indeed a need to define science diplomacy, as many young scientists and engineers seem to be interested in contributing to that field. Questions still remain as to how to train scientists and engineers in the fundamentals of diplomacy and how to train diplomats in integrating science, technology and engineering in their day-to-day decision making. As an engineer, I may not know exactly how to define science (or engineering) diplomacy, but I certainly know how to recognize it when I see it and/or am part of it. Over the past 15 years, I have had the privilege to work with younger people (mostly engineers) interested in development issues. I have been in the field with many of them, have offered lectures, taught classes, and contributed to workshops and seminars on the role of engineers in addressing the many technical and non-technical issues that contribute to human development and poverty reduction in general. In 2001, I founded Engineers Without Borders (EWB)-USA and co-founded EWB-International. The former now has more than 16000 professional and student members in the US alone working on 600 or so projects in 45 countries. In 2004, I also started a program on Engineering for Developing Communities at the University of Colorado, which in 2008 became the Mortenson Center in Engineering for Developing Communities. The center, which I co-direct, promotes integrated and participatory solutions to humanitarian development by educating globally responsible engineering students and professionals to address the problems faced by developing communities worldwide. In 2013 and 2014, I served as a US Department of State Science Envoy to Pakistan and Nepal, where I explored and initiated activities around Science, Technology, and Engineering for Development (STE4D). All the aforementioned activities have shown me that science (or engineering) diplomacy is alive and well. Science and engineering diplomacy may not always take the ideal theoretical form expected by diplomats and bureaucrats who populate the halls of foreign ministries and embassies around the world. The engineering diplomacy that I have experienced over the past 15 years takes place in classrooms, seminars and popular meeting places as well as in remote villages where people do not have their basic needs met. My version of engineering diplomacy came out of observing or facilitating discussions between people from different backgrounds, cultures and disciplines, people who most of the time had never met or assumed that they had nothing in common before they met, or were told that they should dislike each other. I remember putting together in 2010 a meeting in Cyprus that brought 40 participants from EWB-USA, -Israel, -Palestine, -Egypt, -Jordan, -Lebanon, and –Greece. Our goal was to develop a joint initiative in the Eastern Mediterranean region around issues of water, energy and food, and ultimately create a peace-engineering-driven initiative in that region. The participants worked together for four days in developing joint engineering initiatives. Of course, most of the initiatives did not materialize due to the geo-political constraints the participants had to face upon returning to their respective countries. A same meeting was held again in 2011 to reinforce the decisions made in 2010. Several positive outcomes came out of both meetings. First and foremost, priceless life-long friendships were created among the participants. Second, joint projects around water and energy issues were considered and planned. Finally, and more importantly, the two meetings showed that peace is possible when engineers and scientists of various countries work on key issues in a collaborative way despite geopolitical or other constraints. Even though the two Cyprus meetings never made it to the international news, they represented for the participants a unique moment in their own lives. I would refer to that as an “Apollo-Soyuz moment”, to borrow a term used in the space program. 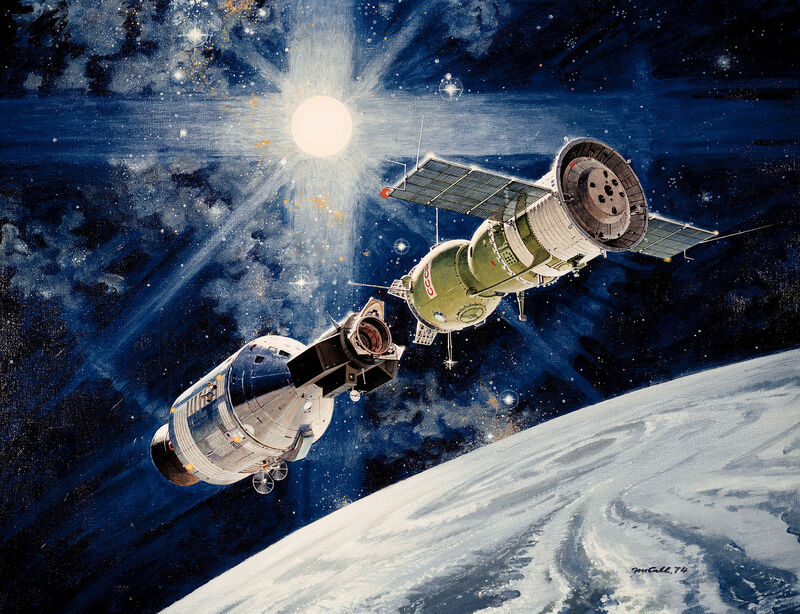 It refers to what happened on June 17, 1975, when the American Apollo and Soviet Soyuz spacecraft docked in space for the first time. That event showed that goodwill and peace are possible through science, technology and engineering collaboration despite geopolitical disagreements. The “Apollo-Soyuz moment” can be considered as an early example of science and engineering diplomacy. I wrote this blog at ICTP in Trieste while attending a workshop on entrepreneurship for scientists and engineers from developing countries organized by Dr. S. Raghu from the USA. The workshop brought together 33 young people from 25 different developing countries all interested in business development and entrepreneurial ventures. These ventures address priority areas of sustainable development whose solutions are based on science, engineering and technology innovation. This was the second time I attended such a workshop, the last one being in 2014 in Islamabad, Pakistan. The Trieste and Islamabad workshops were Apollo-Soyuz moments that lasted a week each. They illustrate another example of a science diplomacy activity where science, engineering and technology are used as a springboard for innovation, business development, and job creation. The world is thirsty for hundreds or even thousands of such training workshops and Apollo-Soyuz moments to address the needs of developing countries but also those of poor communities in rich countries. One can only hope that in the years to come the international engineering and scientific communities will realize how critical science, engineering and technology are in making the world a better place while contributing to the 17 Sustainable Development Goals launched by the United Nations in September 2015. More than ever, scientists and engineers need to become aware that they are more than providers of scientific and technical knowledge and solutions. They can also be entrepreneurs, peacemakers, and facilitators of sustainable human development. Making the world a better place for ALL is no longer an option for the scientific and engineering communities, it is an obligation. Bernard Amadei is a professor of civil engineering at the University of Colorado at Boulder.